Ben Enwonwu’s painting of Ile-Ife princess, Adetutu Ademiluyi, known as Tutu, was on Wednesday, in a London auction, sold for £1, 205,000, four times more than expected. In naira terms, it was sold for N508, 358, 301, an African record. The Nigerian masterpiece, initially declared missing was found in a “modest north London flat” recently. The identity of the buyer of the Lot 47 has not been disclosed yet. 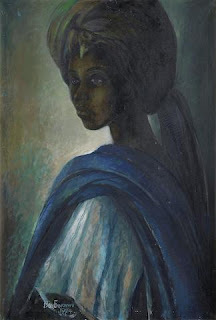 There were other Enwonwu’s paints sold at the same auction, but none fetched anything near Tutu.